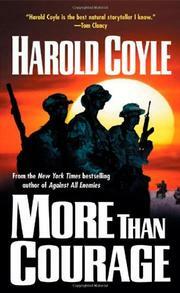 Steel-jawed crafter of military thrillers Coyle, a Virginia Military Institute grad and 14-year Army veteran who took on the Oklahoma City terrorist attack but placed it in Idaho in Against All Enemies (2002), now digs a deeper trench of emotion than on any previous Coyle battlefield. While it takes courage to put one’s self in harm’s way in battle, Coyle tells us, something more than courage is needed for men left dug in behind enemy lines or even taken prisoner. In Syria, logy Lieutenant Commander Kevin Shiflet has been flying a midnight reconnaissance milk run over the desert, looking for terrorists and training camps, months past his rotation date for rest and recovery. Below, also dug in long past their date of replacement, the fourteen members of Special Forces Recon Team Kilo, doing around-the-clock surveillance with no downtime, see themselves as the tip of the mightiest killing machine ever assembled: “Still, it was a fragile tip, in danger of becoming dull due to overuse and prolonged exposure to a harsh and unforgiving environment.” Now in their eighth week of hiding without rest and calling in bomb strikes, the near-demoralized team is led by Captain Erik Burman, known by the enlisted men as the possessed Captain Ahab, and First Lieutenant Ken Aveno, known as Captain Queeg for his strict attention to detail. Both are West Point grads, and Burman’s attitude to Aveno is Me Tarzan, You Jane. The group is at the mercy of orders issued by faceless staff officers often thousands of miles away. Special weapons (nuclear, biological, chemical) from Iraq are being stored in the Syrian desert and must be routed out. In furiously accurate scenes, the team finds itself cut off and eventually captured. Then come brutal imprisonment and the mounting of a later rescue of survivors. Brilliantly immediate, a right-now novel with rounded characters, and indeed quite moving once the team falls into Syrian hands. Really well done.